James Bond, also known as 007 is a fictional British spy created by writer Ian Fleming in 1952. Fleming wrote numerous novels and short stories based upon the character and, after his death in 1964, further literary adventures were written by Kingsley Amis (pseudonym “Robert Markham”), John Pearson, John Gardner, Raymond Benson, and Charlie Higson. In addition, Christopher Wood wrote two screenplay novelisations and other authors have also written various unofficial permutations of the character. 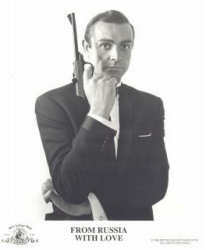 Although initially made famous through the novels, James Bond is now best known from the EON Productions film series. Over twenty films have been made (the first being Dr No. starring Sean Connery in 1962 made with a budget of $1,000,000) as well as two that were independently produced and one American television adaptation of Fleming’s first novel under legal licence. However, it is generally considered that only the EON films are “official”. Albert R. (Cubby) Broccoli and Harry Saltzman produced most of these up until 1975, when Broccoli became the sole producer. From 1995, his daughter, Barbara Broccoli, and his stepson, Michael G. Wilson, jointly continued production duties. James Bond is now one of the most famous fictional characters of all time and there have been thousands of books, comics, posters, memorabilia items, toys and other items based on the character which have been produced over the past 50 years and are continuing to be prodcued today. Pictured left and right: Ian Fleming’s early books Casino Royale and From Russia With Love. 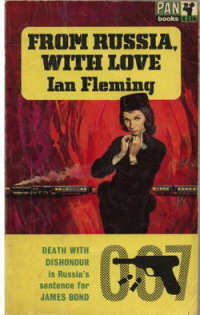 Ian Fleming’s early books are extremely sought after. In Bloomsbury Auctions March 2006 sale a first edition copy of Casino Royale, the author’s first book noted as a fine copy fetched £6500 ($11000). An inscribed copy to Ian Fleming’s friend Percy Muir “To Percy who guided my early steps in literature – but not down those dark corridors! Affectionately Ian.” fetched an amazing £21,000 ($40,454 USD) in February 2005 also at Bloomsbury Auctions. James Bond was given a face in 1957 by John McLusky (1923-2006) in the Daily Express newspaper. The then owned Lord Beaverbrook approached Ian Fleming to adapt his stories into comic strips. 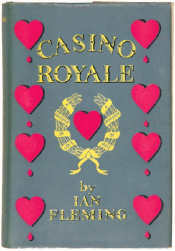 After initial reluctance by Fleming who felt the strips would lack the quality of his writing, agreed and the first strip Casino Royale was published in 1958. Since then many illustrated adventures of James Bond have been published, including every Ian Fleming novel as well as Kingsley Amis’s Colonel Sun, and most of Fleming’s short stories. These comic strips have been reprinted including in 2005 by Titan Books. 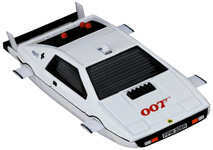 The Bond Movies brought the franchise to the world audience and each movie has had its associated memorabilia and toys. James Bond in the movies has always had fantastic gadgets, fast cars and beautiful women. Pictured left: Corgi 24 Carat gold plated. From Goldfinger. Spoked wheels. Wing mirrors. Full body decoration. Interior decoration. Rear bullet proof screen. Ejector seat. Rear tyre slasher. Machine guns. 12,000 piece worldwide quota. One very popular area of collecting is die-cast and the Bond vehicles and cars. Amongst the most famous of these is the Aston Martin DB5 seen in several Bond films including Goldfinger. Although the films used a number of different Aston Martin DB5s on film and for publicity one of them was sold in January 2006 at an auction in the US for $2,090,000 (USD) to an unnamed European collector. Luckily smaller versions have been produced over the years by makers such as Corgi, the Danbury Mint and others. Pictured right: Corgi Lotus Underwater from The Spy Who Loved Me – authentic 1:36 scale die-cast replica features working side and rear fins, as well as a re-loadable surface-to-air missile launcher. Collectors also specialise in specific actors and the debate still rages on who was the best Bond with the camps slit equally over Sean Connery and Roger Moore. Not fogetting George Lazenby, Timothy Dalton, Pierce Brosnan, and the newest Bond Daniel Craig. Pictured left: A Sean Connery still from the 1963 film From Russia With Love. Specialist auction houses such as Bloomsbury for books and manuscripts, Vectis for toys and die-cast and large auction houses such as Christies which run regular memorabilia and film poster auctions mean that a rare or special James Bond lot is never far away from auction. Pictured right: Swatch James Bond Anniversary Watch from The Man With The Golden Gun. For merchandising there are always new films and anniversaries that can be used and for collectors there is over 50 years of collectibles history to be tracked down. James Bond finds new enthusiasts in very generation so the franchise looks set to continue well into the future.